Portrait Film by Alexandre Archimbaud made in connection with the exhibition TOTEM at Royal Copenhagen, Amagertorv 6 in Copenhagen. The exhibition runs until 31 March 2019. Royal Copenhagen is proud to present the exhibition Totem by the Danish visual artist Cathrine Raben Davidsen. With this exhibition Royal Copenhagen launches a new chapter in an old tradition of the company: inviting recognized talented artists to develop new unique works. Totem is the result of Cathrine Raben Davidsen’s two-year artist residency at Royal Copenhagen’s factory in Glostrup. In close collaboration with the factory’s experts she has experimented with new shapes, glazes and firings. 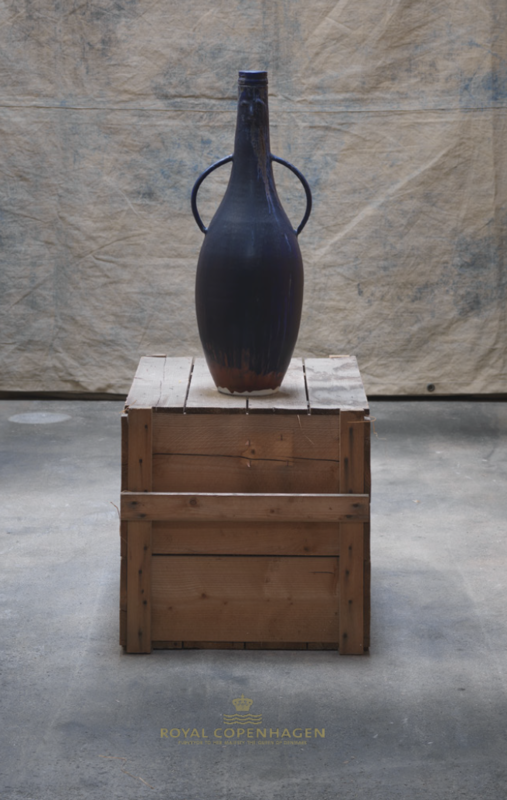 The collaboration has resulted in more than 150 unique ceramic works comprising vases, jars, jugs and plates. A selection of these is on display in the exhibition. For the ceramics Raben Davidsen has been inspired by prehistoric Mexican terracotta, Danish Bronze Age stoneware and German Bartmann ceramics from the 16th and 17th centuries. The characteristic feature of these styles, later known as Bellarmine vases or face urns, was the embedded motif of an old man’s bearded face on the neck of the bottle. In some regions, these containers were also used in occult rituals with the purpose of expelling evil spirits. By playfully adapting this stylistic expression to her own vases, Raben Davidsen introduces the association to the ghostly and spiritual in her work, juxtaposing the old tradition with a modern mystique. In glazing the ceramics, Raben Davidsen has mixed various glazes and even 24-carat gold on selected pieces. She has treated some of the glazes with oxides, while others have undergone a salt firing in the kiln. Among the most famous historical glazes used from the Royal Copenhagen archive is Patrick Nordström’s famous Oxblood, which can be seen in the red colored series Totem Clan. In addition to the ceramic body of work, Raben Davidsen is presenting a series of new paintings, drawings, prints and an animation film. The motivic world is populated with human figures, animals and plants. In the paintings, one can glimpse human faces and bodies emerging from the saturated colour field surfaces. In the drawings and prints, one encounters shadowy images of floating bodies, owls, deer, whales, and jellyfish move around in fluid, formless spaces, seemingly in constant flux – in a state of dissolution towards a new dimension. By portraying this mix of living organisms inside a fluid space, Raben Davidsen explores the organic synthesis of humans, animals and the cosmos. A core theme of Cathrine Raben Davidsen’s practice is a strong interest in mankind’s relationship with nature and our understanding of the spiritual world. In particular she sees the concept of transformation as an omnipresent precondition of humanity – a continuum that connects us with our surrounding environments. The title – Totem – stems from ancient traditions in cultural history and religion such as animism and totemism. These are belief systems practiced by indigenous peoples that consider the connection between culture, nature and the cosmos as holistic. Animism is the belief that everything in nature, both the organic and the inorganic, has a soul in the same way as human beings. Among the animistic believers, a totem is an object, subject or place of worship that aims to gather and strengthen the group’s identity and cohesion. A totem can be either a tree, an animal, a mountain or a river. By exploring various elements of the spirituality and mythology and embedding these notions within her own work, Raben Davidsen asks how we can view and re-appreciate the meaning of these ancient traditions and belief systems anew. In connection with the exhibition, the catalog TOTEM has been published with texts by art historian Lone Rahbek and art historian and curator Aukje Lepoutre Ravn. The catalog can be purchased in Royal Copenhagen’s store. The exhibition is curated by Aukje Lepoutre Ravn.